In Nov/Dec I was introduced to Zumba for the Wii. Of course I had already heard about Zumba and everyone raved about it but I had never seen it in action. When I gave it a whirl with the Wii there was one thing that really took away from the experience and that was the belt you had to wear so the Wii could register your moves. 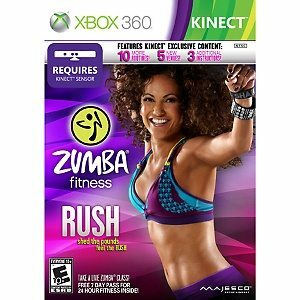 When I heard Zumba Rush was coming out for the Kinect I was very excited. I really enjoyed my experience with Zumba but felt it would be a much better experience with the hands free that the Kinect offers. One of the big draws with Zumba is how fun it is. That though you can sweat through a workout by the time you are done you don’t even realize you worked out. Just this past week the contestants of Biggest Loser were taken to a Zumba class. Through the whole episode I was itching to pop in my Zumba Rush and enjoy a little Zumba. This is the key to good exercise, it keeps you coming back for more. I was not disappointed in the least with the Zumba Rush game. I was wondering how well the Kinect was going to record my moves with all the moving from side to side and arms flying in the air. Overall I think it scored me well. This was also with using the Kinect Zoom that I installed right before giving this game a try. Six million players and counting have already discovered the exhilarating Zumba® Fitness interactive video game workout. Following the worldwide best-selling original, Zumba® Fitness Rush builds on that phenomenal success while providing the most technologically advanced, feature-rich interactive Zumba® experience to date. 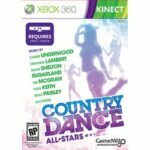 This cutting-edge game layers in a wealth of exclusive content only available on Kinect, plus lots of new features and improvements that amp up the dance-fitness play so you can melt away the pounds as you party yourself into shape! There are six trainers to chose from when selecting your particular Zumba class: Beto Perez, Tanya Beardsley, Gina Grant, Kass Martin, Jason Thompson, Erica Pierce. Promises loads of fun are dance styles such as: Merengue, Samba, Bollywood or Latin Pop. The main menu consists of options: Single Song, Full Class, Learn the Steps, Progress Tracker, Zumba World, and Options. I love that you can just from low, medium, or high intensity. Until I can really get my grove on I tend to stick with low. I think this will help me learn the steps before I kick it into high gear. You always have the option of learning the steps before you jump in. I decided jumping in was much more fun! Once you have selected your song or class your workout begins. Your trainer appears and does a few small warm up moves. There is a little box that shows you when you are getting ready to change to a new move. You can see how many stars you are earning on your star rating bar as the class progresses. One feature that is great for us since Honey loves to workout with me is the option to add a second player. All they have to do is enter the screen so the Kinect can register them. I always love games that allow a little customer creativity. With Zumba Rush you have the option to create your own custom playlist. You can create up to 12 custom playlists loaded with the music of your choice. 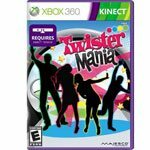 Featuring 50% more content than Zumba Fitness 2 on Wii: additional routines, new venues and more instructors, plus voice control, online connectivity and DLC support for the most feature-rich, interactive Zumba experience to date. Get a total body workout with 42 electrifying new routines and music tracks (10 exclusive to Kinect), now featuring hits from today?s hottest artists along with contagious Zumba originals that let you lose yourself to the music. Learn 24 different dance styles as you play (more than twice the number featured in the original game). From fan favorites like Merengue and Cumbia to new additions that include Bollywood, Ragga, Bachata, Latin Pop, Quebradita and more. Dance naturally hands-free with Kinect technology that enables full body motion tracking for an unencumbered interactive workout. Two player support lets you party together with friends and family members in a cooperative format. Zumba Rush is my #1 game in my arsenal of XBox games. In fact every time I see the trailer or Zumba on TV it makes me want to grab my game and ZUMBA! This game is good for beginners and advanced players. It is fun and customizable and will never get old. That is the biggest advantage to a game vs a DVD there are so many options you always are getting a different workout. Before you go check out this fun Zumba Flash Mob video. Imagine walking down the street and unexpectedly faced with a Zumba mob! Interesting, I am always looking for new ways to exercise. Maybe they will come out with a demo on Xbox Live. I do love my Kinect. 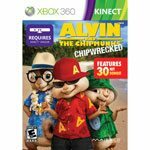 My girlfriend and I went through all of Kinect adventures together and had a blast. We also enjoy the Dance Central games. Demo would be a great idea so you can see what you think first. Or rent it? I have always wanted to try this, but I have ZERO rhythm ! Great review. My daughter just got a Kinect for Christmas and was looking for some new games. She love to dance so I think she would love this one. Plus she get’s a workout in.